The women finished out pool play and the first elimination round on Friday. 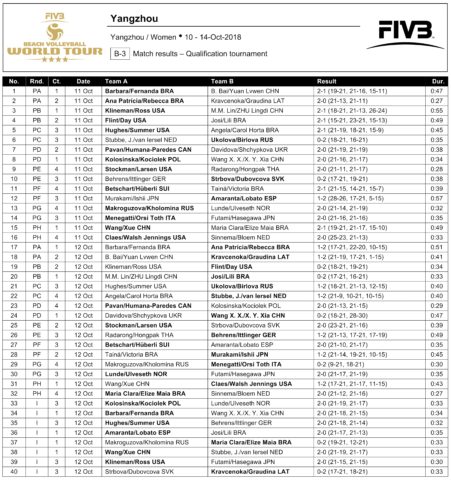 Six of the second round matches went to tiebreak, including the pool title matches in Pool A, C and H.
In Pool A, it was an all-Brazilian affair, which saw top seeded Barbara Seixas de Freitas/Fernanda Alves fall to No. 16 Ana Patricia/Rebecca 21-17, 20-22, 15-10. In Pool C, Russia’s No. 19 Evgenia Ukolova/Ekaterina Birlova edged past third seeded Americans Sara Hughes/Summer Ross 21-18, 13-21, 15-12. 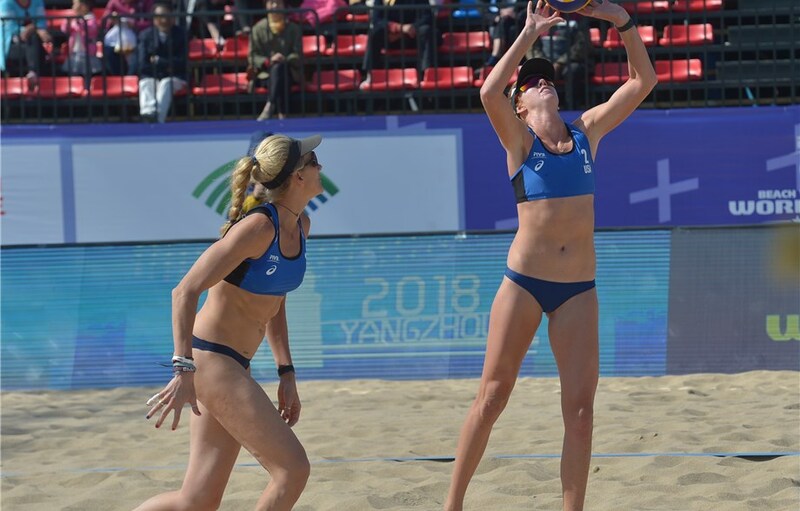 In Pool H, ninth-seeded Americans Kelly Claes/Kerri Walsh Jennings held on for the 21-17, 17-21, 15-11 win over China’s No. 8 Fan Wang/Chen Xue. Pool B was a battle of two American teams with No. 15 Betsi Flint/Emily Day outdoing No. 2 seed Alix Klineman/April Ross in straight sets (21-18, 21-19). In the first elimination round, teams from five countries earned their spot in the Round of 16 with two teams from the United States and two from Brazil highlighting the group. All eight Round 1 matches were decided in straight sets. The marquee matchup of Round 2 will pit former American partners Kerri Walsh Jennings and April Ross against each other. The pair won the Olympic bronze medal together in 2016 before parting ways in the spring of 2017. Women’s Round 2 action is set to begin at 10:40 p.m. ET.